Welcome to Catch it at the Comic Shop, where the Panel Patter team looks at what's coming out at your favorite store or digital device this week. Each one of us that participates picks up to five items due out this week, with a little bit about why we like them. (NOTE: We use solicitation material for this, so if we miss creators, please talk to your publisher!) Sometimes we might only have a few items to share, other weeks, keeping it to five will make for hard choices. Here's what the team wanted to highlight this week..
We at Panel Patter love Black Hammer. And we think you should too. 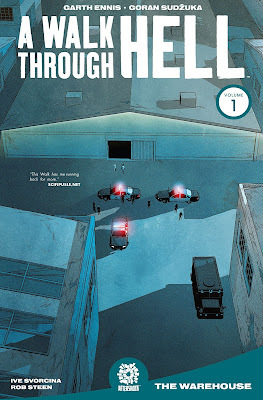 Jeff Lemire is doing wonderful things within this story (and its associated miniseries). He's taking all of these superhero tropes and mashing them together in a weird mystery box of a story that's heartfelt, funny, tragic and feels like something that's really original even as it's an homage to many different things. This book collects the first 2 arcs of the story and those will make for a spectacular read in oversized format. Dean Ormston and Dave Stewart are doing incredible work on art. This is a real must-read. This is a weird, dark, messed-up book. And I mean that as a total compliment. This is a story about a family who's all insane and they go on a violent road trip and do all sorts of insane things. They all buy into the delutions until one day, one of them...doesn't. That's a really great hook for a story, and the first 2 isues isues have been dark and twisted. Chris Sebela is having a hell of a year, and this is one more excellent story he's writing. 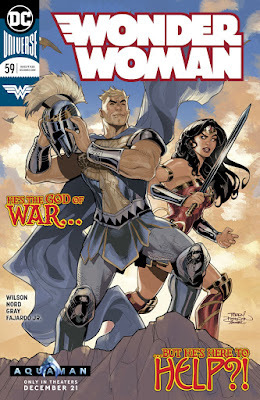 So, yu should really start with issue #58, where Wilson and Nord come on as the new creative team for Wonder Woman. I loved the New 52 Azzarrello/Chiang Wonder Woman book, but the series hasn't really been of interest t me since then. I read Rucka's more recent run and I thought it was good but not spectacular. I'm really curious to see what a fresh voice will do on the character, and Wilson is that. She's been writing some spectacular superhero comics the past 5 or so years on Ms. Marvel, so I'm thrilled to see what she'll do with the world of Wonder Woman, which is filled with both superheroics and mythology. 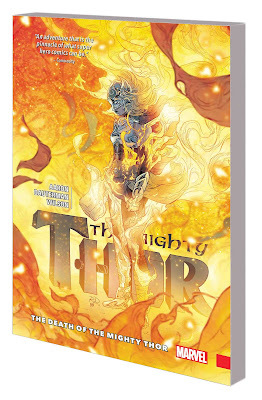 Jason Aaron has been doing some truly remarkable work with the Thor comics over the past 5 years or so. It's some of the best superhero comics - really, some of the best comics, period, being published. And probably the best thing he did was to put the hammer in the hands of someone who is very worthy, Jane Foster. The character of Jane Foster (The Mighty Thor) is such a compelling character, I might actually like her more than the original (Odinson) Thor. Jane Foster is an incredibly compelling, courageous woman battling cancer, and is simultaneously the God of Thunder. It's some trule spectacular, moving, funny, sweet and poignant superhero comics. And it all comes to a head in this volume. Read it, read all of it. A Walk Through Hell Vol 1 by Garth Ennis, Goran Sudžuka & Co., published by Aftershock Comics I jumped in late with this one. No worries though because this story reads way better as a collected volume. The undertones of the story bleed through the panels and the story oozes out each page at such a slight and drifting pacing that you find yourself out of breath in the end. But why though? 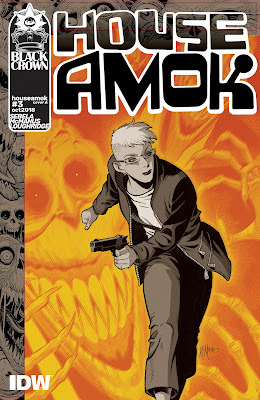 With 3 of the 5 issues not giving much more to the end game than a few leads you are left with a modest hunch that something supernatural lurks around the next corner. This is a fun and daunting read and I recommend this for anyone’s collection. Coming as no surprise to anyone that someone associated with the Panel there would be a Vault comic coming with recommendation. 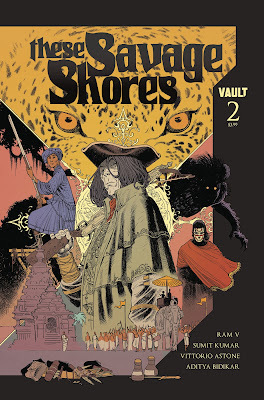 The first issue of These Savage Shores was quite a strong debut several weeks back and I look forward to how this enchanted story continues with the innovative pacing and elaborate and vivid illustrations. Though still quite new as a staple to anyone’s weekly pull list, I’d be remiss to not include it as one I pass on to others looking for something a bit different out there. Go pick this one up as it’ll be an easy title to jump into. As I’ve aged into my late 30s I’ve grown tired of the superhero branded comics of the mainstream, but there will always be room for Spidey. I enjoy everything about this character and the creators that have had his run over the years have managed to make things true to form as well as fresh and exciting. 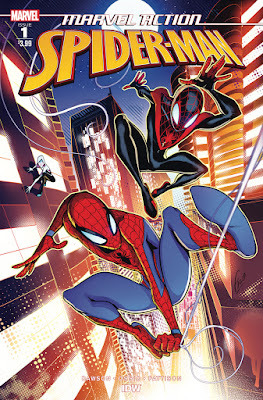 This new Spider-Man comic isn’t directly from Marvel, but instead it’s from IDW and marketed as a Marvel interpretation of the character. The biggest concern I have for this comic is how in the world they are going to manage to have Peter Parker and Miles Morales high school buddies. But hey.. creative control right? 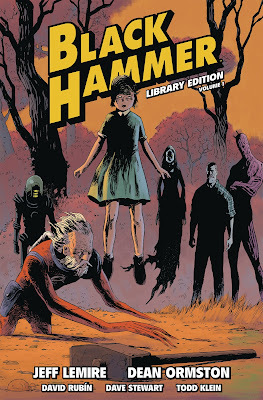 First, if you aren’t reading Black Hammer by now, dear god.. please start! And what better way to start then with this gorgeous collected volume of the entire first and second story arcs. Second, if you are reading Black Hammer, then you are most likely in the same situation as me... the proud owner of every variant of the single issues, each copy of the collected trade’s, and now faced with the heavy-but-not-too-difficult decision as to whether or not to also buy this collected package as well. Lemire, my money is right here.. take it.